Plastic waste in Ghana has become a major social and ecological problem, due to the adverse effects of plastic pollution on both human health and the environment. Especially during periods of flooding, plastic waste chokes the drainage systems of most Ghanaian cities. The need for initiatives to improve sanitation in our community is of great importance. Of the many local waste management companies, only few practice segregation and recycling of waste — and not yet at scale. In the area of plastics recycling, Blowplast recycling is one of the formal organizations which recycles water sachet and black bags in large volumes. 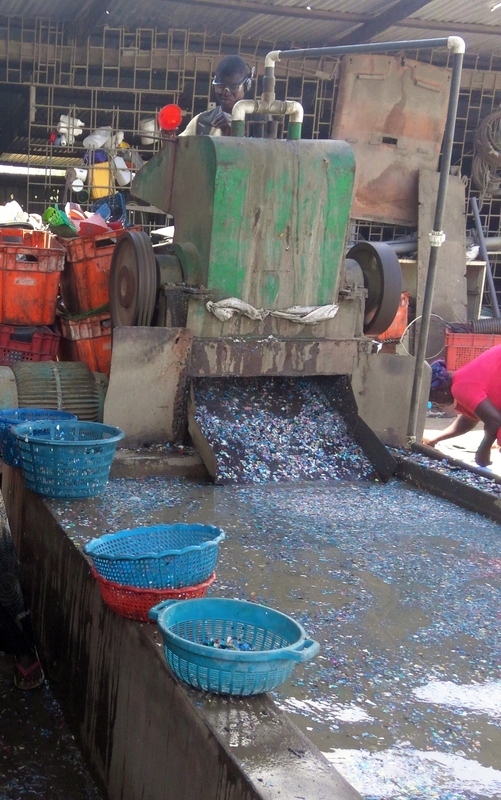 What a lot of people do not realize is that plastics recycling in Agbogbloshie is a major activity within the informal sector recycling industry. Because we are current developing a plastics micro-factory as part of the AMP toolset (one of first prototypes is a mini-kiln for moulding plastic tiles), we continue to work with Agbogbloshie plastics recyclers in order to better understand how the process works now and how it can be improved. One of the more advanced industrial setups we have come across is located on Abosey Okai Road. Stages in the process flow include sorting, shredding and pelletizing. This micro-factory engages more then 20 youths in Agbogbloshie in full-time employment! The sorted plastics are ground using a milling machine (see picture below) which is connected to a water bath. 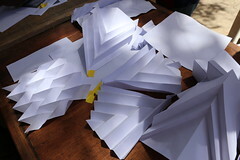 Shredded plastics are then collected and dried. Finally, the shredded high-density polyethylene (HDPE) are pelletized using an extrusion machine. 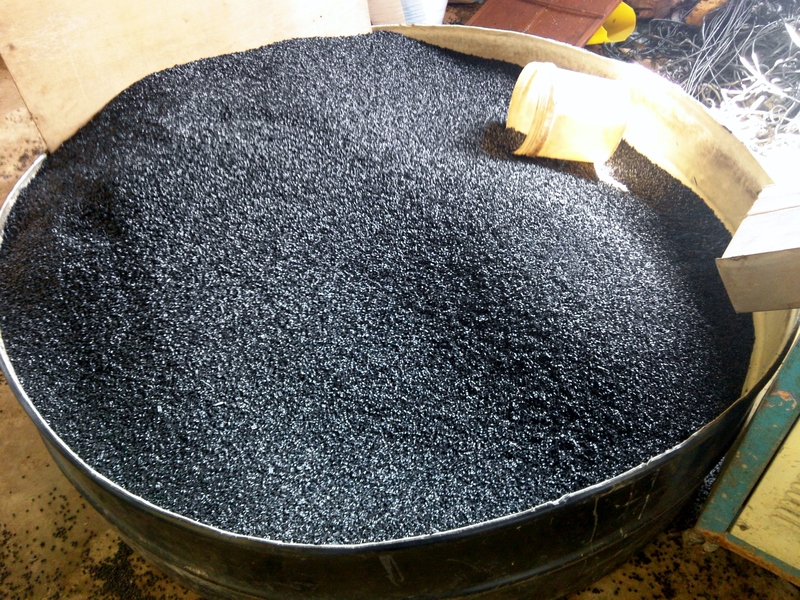 These pellets — made out of plastic waste from all over Accra — are then sold as feedstock to formal industries both in Ghana and globally that have the capability to produce plastics films. The existing model of plastics micro-factories in Agbogbloshie deserves support and attention. In effect they perform a massive public service: cleaning up the city of Accra, by making profits from our plastic waste.